I am a girl who loves to grill! For me, grilling season starts early at the first signs of spring. At that point, it’s still a choice whether I cook outside or just turn on the oven. Then as summer takes hold, grilling becomes an all-out necessity and maybe even a little bit of an obsession! I can honestly tell you that during the summer, if we are eating cooked food, odds are, it was cooked outside on the grill! And what a grill it is! I picked out the biggest propane grill I could afford and thanks to the Husband who converted it to natural gas, there’s no more running to the propane exchange in the middle of dinner! I’ll tell you in one word why I love a gas grill: convenience! With the turn of a knob (ok, five knobs), I am cooking. No fuss, no hassle. I have baked desserts on the grill, pizzas, artisan bread, casseroles and even kale! Whoever said that the grill was the man’s domain never came to my house, because this baby is mine, all mine! Rarely do I deal in absolutes, but for grilled salmon, I have two: I always cook it on a cedar plank and I always chose wild-caught salmon. 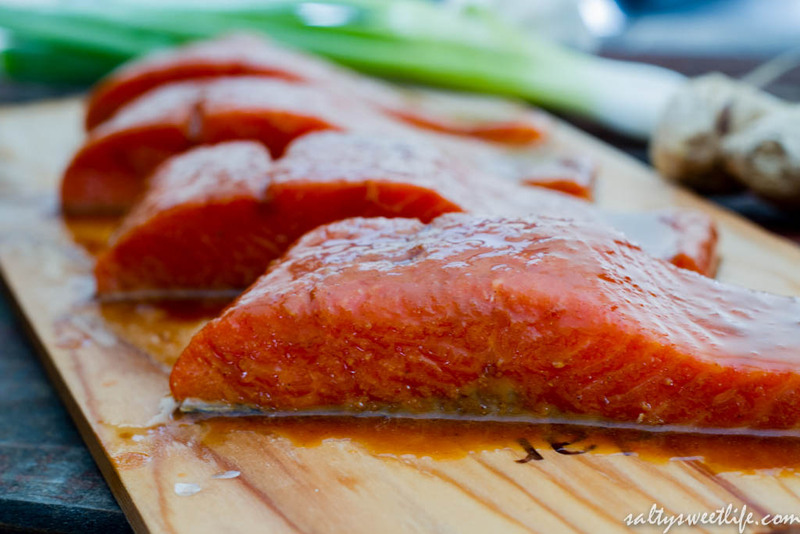 If you’ve never had wild-caught salmon cooked on a cedar plank, then you are missing out! First of all, the salmon. A few years ago, I swore off salmon entirely because I just didn’t like the flavor. Then I tried wild-caught salmon during a trip to Oregon and I was hooked! It was nothing like the farm-raised salmon I had been choking down! The flesh was deep and rosy and the flavor was rich without being oily or funky. I buy wild-caught salmon and steelhead at Costco, where a two-pound fillet averages around $25.00. I can get eight to nine portions from a fillet, which makes it well worth the cost. Salmon Fillets are glazed and ready for the grill! 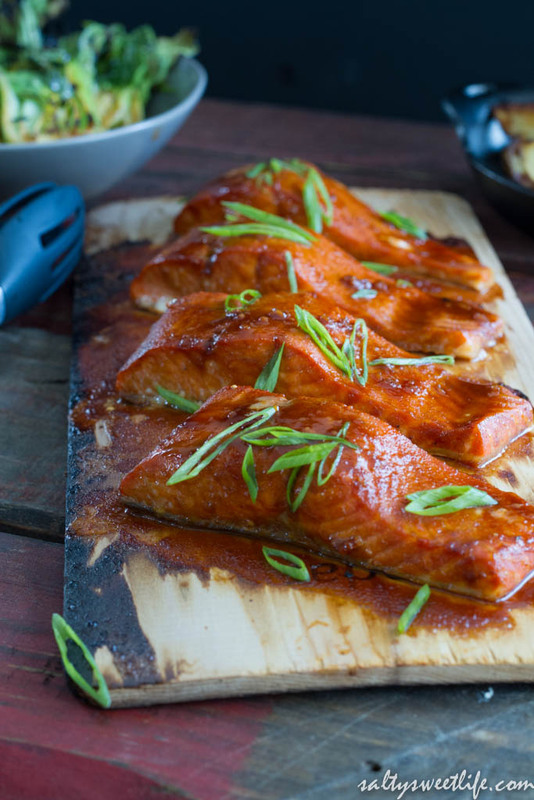 Grilling salmon on a cedar plank gives it amazing smoky flavor with very little effort. The only you have to remember is to soak the plank in water for at least 2 hours prior to grilling. Soaking the planks prevents the plank from burning (read: bursting into flames) and also creates that wonderful cedar smoke! 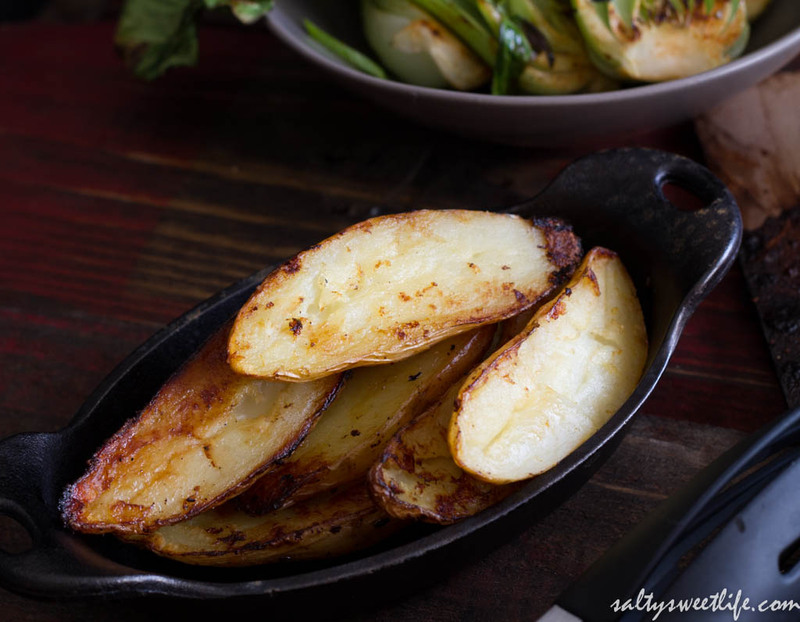 Simply take a roasting pan or a sheet pan and fill it with water. Place the plank in the pan and weigh it down with something heavy, like a mug or a large canned good. When it’s time to grill, place the salmon on the cedar plank and set it right on top of the grill. Grill with the lid closed so that you retain all the smoke inside the grill. Cedar planks are very easy to find–check your grocery store near the seafood department. In the past I’ve purchased these on Amazon.com and more recently, I found these at Costco, which were larger and thicker. 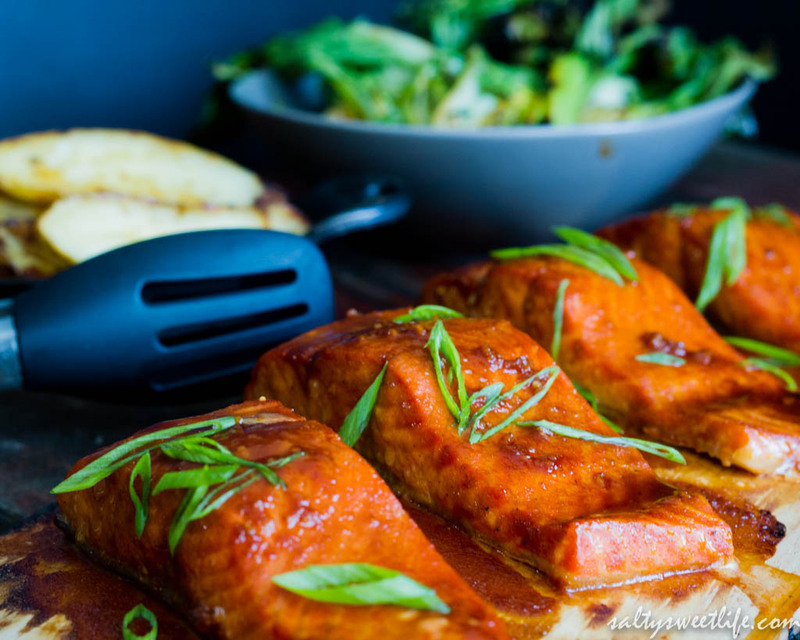 This salmon is glazed with a sweet and spicy combination of sriracha, ponzu and soy sauce. It comes together so quickly that you’ll be happy to serve it even on a busy weeknight. The day I made this, I soaked the cedar plank before I left for work so that once I got home, it would be ready to go! The sauce is simple, yet bold and flavorful–just toss everything in a saucepan and let it bubble until it thickens, then slather it on the salmon and grill it! It is that easy! In a small saucepan over medium heat, combine the soy sauce, ponzu, brown sugar, sriracha sauce, sesame oil, garlic, grated ginger and a pinch of five-spice powder. Allow the mixture to come to a simmer, stirring occasionally. Simmer until the mixture has reduced by approximately a third, then remove from the heat. Arrange the salmon fillets on the cedar plank and season them with ground white pepper and a small pinch of salt. With a basting brush, brush the sauce over the fillets, being sure to coat the sides of the fish. I basted the fish several times with the sauce prior to grilling in order to get a nice glaze. Place the cedar plank on the preheated grill and cook the fillets for 6-8 minutes (with the lid closed), or until the fillets are firm to the touch, but still juicy on the inside. Remove the fish from the grill and allow the fillets to rest for 2 minutes. Garnish with sliced green pinions and serve immediately. 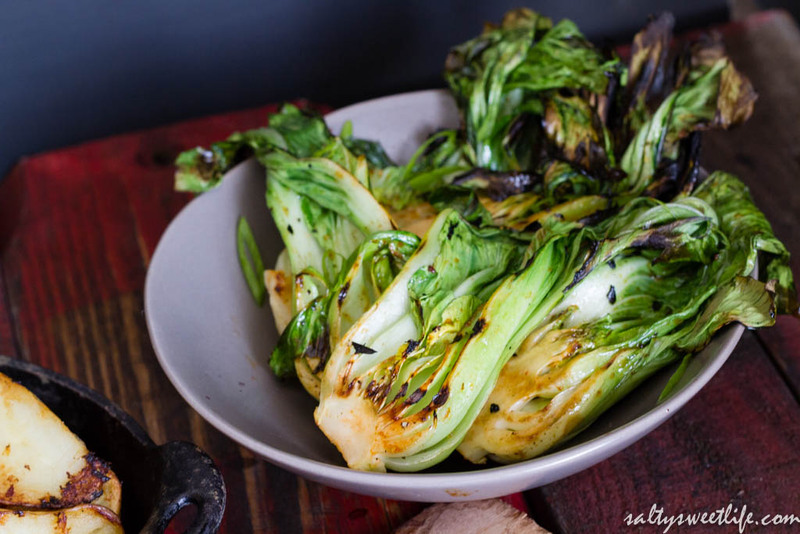 Bok Choy, flash grilled and basted with a little of the Sriracha-Ponzu glaze! Delicious! Fingerling potatoes, roasted on the grill. Tracey, this is absolutely wonderful! I have never cooked salmon on a cedar plank before, but I gotta tell you, after reading this post, I’m putting it on that bucket list. Absolutely no questions about it. And your pictures? Good God! This looks SO delicious Tracey! I have a few cedar planks in my cupboard that are dying to get used! I might have to try this one out! Thank you Candice! I’m so glad you stopped by! 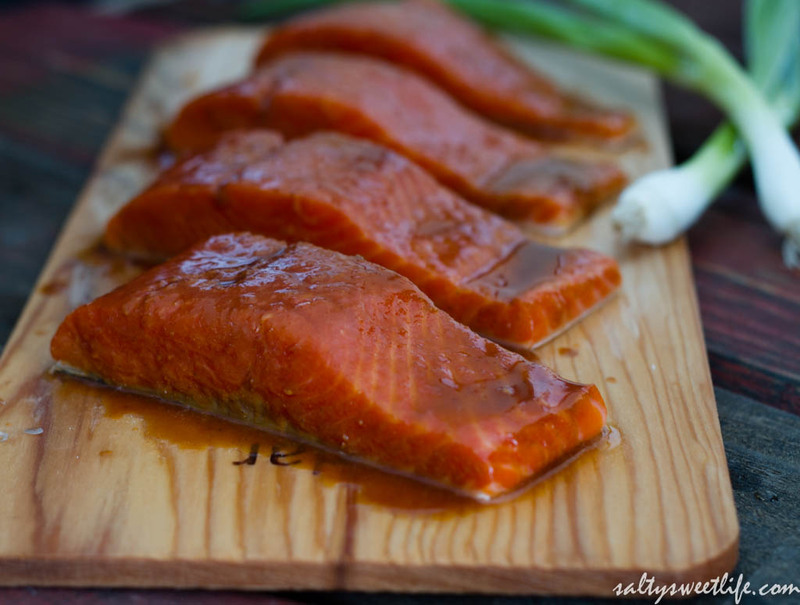 Those cedar planks are gold–they make salmon taste so good! I need to use them for chicken and beef next time! I am glad you included the link for the ponzu. I have another recipe for it but couldn’t find it and wasn’t sure what it was. What a beautiful meal! Thank you Julie! Yes, I definitely wanted people to know what kind of ponzu I was using. There are other types of ponzu that include soy sauce, but that’s not the kind I’m using. This ponzu tastes a bit like lime juice and it’s very light in color. Those salmon looks amazing!! I never thought about using five spice to cook salmon but it sounds so interesting and delicious! Cedar plank and wild-caught salmon? That’s fancy and I never tried before. Looks what I missed out! Hi Maggie! Thank you very much for stopping by! It might look fancy, but I assure you it’s super easy and accessible! The 5 spice is optional, but it really adds a nice flavor! Your pictures are fantastic! Have you ever tried soaking the cedar planks in other liquids, like wine? Thank you so much. Katie! I have only used water, but I was just reading about using wine and beer. Maybe if I have old leftover wine! Love Bok Choy, so underused! What a great recipe! After 18 years in Western Washington, I understand the love of WILD salmon and I LOVE Steelhead! Since I now summer in South Dakota where ‘interesting’ ingredients are hard to find,(soy cause is considered strange) can lime juice be substituted for Ponzu? Also, with cedar planks being sold a dozen at a time, how many times can you use ‘a’ plank? How do you know when a plank is ‘done’? Really enjoy your recipes and info! Hi there! Yes! Wild salmon and steelhead is so amazing! I’ll never go back to farm-raised! As for the ponzu substitute, absolutely use lime juice instead. The flavor is so similar. And I only use a plank once. I’ve though of reusing a plank but I haven’t yet, plus the thinner boards aren’t good for more than a single use–they get really charred. Perhaps the thicker ones could? But I still haven’t tried yet. Thanks so much for stopping by! Tracey, these look positively delicious! I have never cooked with Ponzu sauce, but I have added it to my grocery list. I am drooling. Also, you sound exactly like my mother re salmon: always wild, always grilled on a cedar plank. Too funny! wow this looks AWESOME.. i love a good salmon dish. 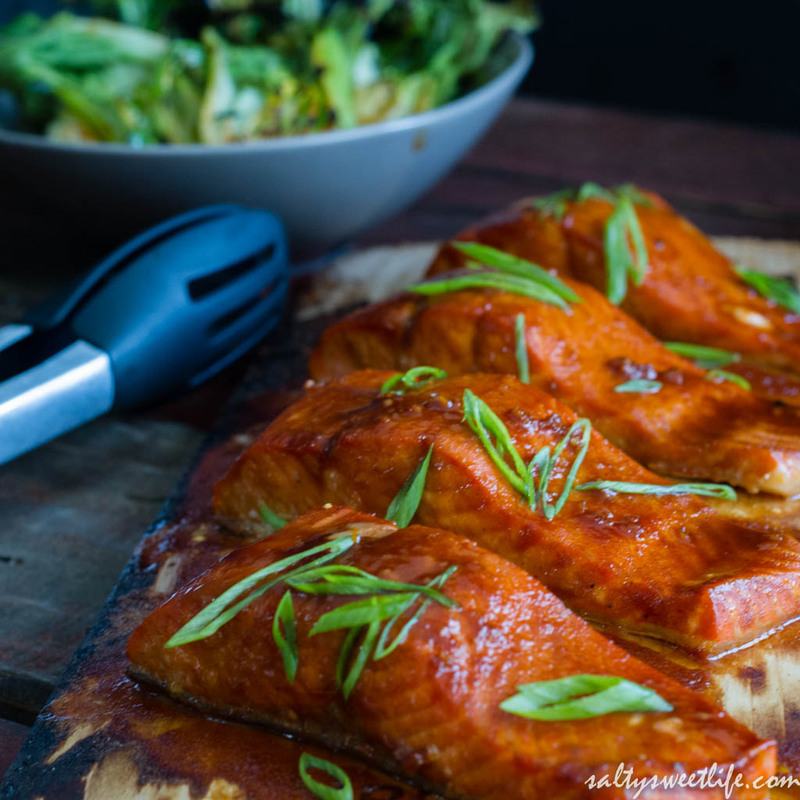 love the idea of a sriracha glaze, i cant get enough of the stuff! definitely something i will be trying. thanks! Thank you Thalia! Please let me know if you try it! The sriracha sauce gives the glaze such great flavor! You are so welcome Michelle! We had it tonight and it was so good!